Before the advent of curb and gutter storm drainage systems, storm runoff was conveyed to receiving waters primarily through swales and ditches. 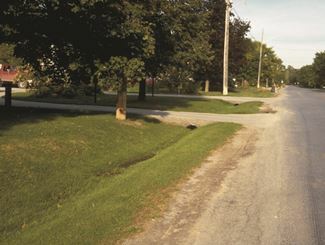 This technique continues to be used in rural areas and some urban subdivisions that want to maintain a traditional rural street aesthetic. The obvious benefit of these systems is that they detain, filter and infiltrate runoff as it is conveyed along the grassed ditch, resulting in smaller volumes of runoff and associated pollutants from reaching the watercourse or stormwater management facility. The terms swales and roadside ditches are often used interchangeably, although there are important differences between them. Roadside ditches are designed to function primarily for conveyance. Bare soil ditches may even act as a significant source of sediment. By contrast, swales and wet swales are intended both for conveyance and treatment, and are often subject to more frequent maintenance. Several studies have been conducted on swales and ditches. In Ontario, a comprehensive evaluation of roadside ditches was completed by J.F. Sabourin and Associates Inc. for Toronto and Region Conservation Authority (TRCA). This report is entitled An Evaluation of Roadside Ditches and Other Related Stormwater Management Practices. The evaluation includes consideration of social acceptance, economic feasibility, potential environmental benefits, and compatibility with current engineering and planning practices.